The other day, I was at home and caught a glimpse of brown fur flashing past the window outside. I expected to find a local truant dog looking for Puz, the resident lab. 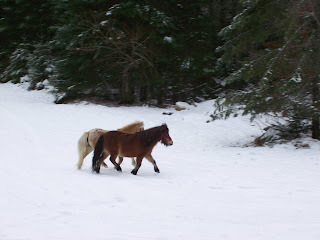 Instead, there were two adorable ponies cavorting (looking for the Adirondack Yule Log?) in the yard. They were a chestnut and a tan, and did everything in unison. Since I don't own horses and have no experience with run-aways, I was unable to catch them. So I watched and took some photos. They couldn't decide what to do or where to go. It really was way too cute - tiny horses and a snow covered forest - I could've been in Narnia. It goes to show - anything's possible in the Adirondacks!